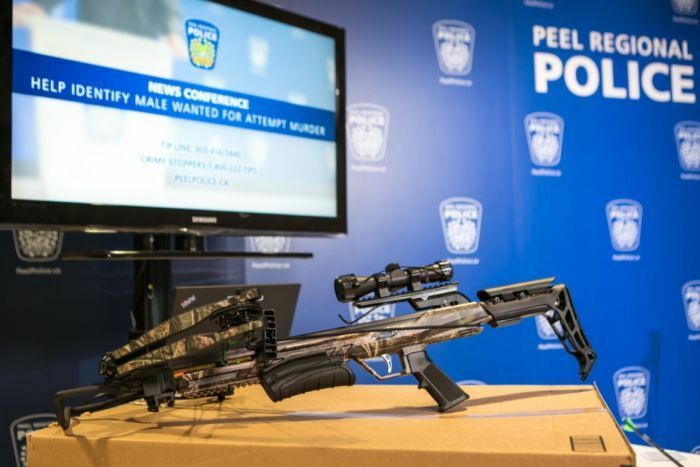 Canadian police are hunting a man who posed as a deliveryman and shot a woman with a crossbow, in what has been labelled a “premeditated” and “targeted” attack. Black-and-white home surveillance footage, released by Peel Regional Police on Monday, shows the assailant standing outside the victim’s door in Mississauga, Ontario, an area north of Toronto, on November 7 last year. He is seen holding a large cardboard box, inside of which police said he had hidden a crossbow. After the 44-year-old victim opened the door, a brief conversation ensued before the man fired the weapon into the woman’s chest and fled on foot, Superintendent Heather Raymor said, leaving her with “life-threatening and life-altering” injuries. “This was not a random act. Comments that were made to the victim by the suspect indicate that [she was targeted],” Superintendent Raymor said in a press conference. “The suspect may have carried out the attack at the request of another individual. The victim spent several months in hospital, Detective Sergeant Jim Kettles added, and she will “be in a recovery phase for the rest of her life”. Superintendent Raymor said the particular type of crossbow used in the attack, designed to “inflict the maximum amount of damage possible”, was typically used by hunters to kill large game, including moose and deer. The suspect, who is now wanted on attempted murder charges, was wearing a distinct baseball cap and shoes, police said.